Linfield boss David Healy took a swipe at Irish League officials following his side's 2-1 defeat by Coleraine on Saturday. Healy though was quick to point out there was no sour grapes on his behalf following the defeat at Windsor Park, and he was at pains to stress that the officials had nothing to do with his side losing. The Blues boss though feels there is a problem throughout the league in terms of communication between officials and teams, and even went so far to say the 'arrogance at times is beyond belief'. "We know all these officials by name and there has to be a courtesy there, but there's a wee bit of an arrogance with these guys, which frustrates the life out of myself, not only today when you lose a game, but other times too, and I know they frustrate the life out of other managers as well," said Healy. "But I want to be clear we did not lose the game today because of the officials, nor did we draw the game against Warrenpoint last week because of the officials. "However, there has to be a realisation that this isn't a Mickey Mouse kickabout on a Saturday where you can come and have a laugh with your mates refereeing the game. "The arrogance at times is beyond belief. It's a lot to do with communication. "There's got to be a bit of give and take, there has to be respect from myself, the other managers and benches. It shouldn't be an us and them scenario, but it seems like that. "This is over the course of a number of weeks. You can't speak to these guys after games, they just palm you off and then they laugh at you. "This is serious business. 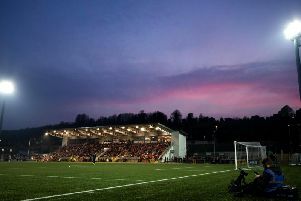 This is Coleraine, Linfield, Glentoran, whoever it is trying their utmost to earn an extra corn by getting into European football, win trophies and be successful. I don't think these guys realise that. "Every time you pick up a paper or watch highlights there is always a controversial decision and managers left frustrated by it. "It's an easy one at times for managers to come out and paper over the cracks and blame the officials after a poor performance or result. "But I'm not doing that today because we were so poor, but there needs to be a respectful communication."